Daylight savings time happens this Sunday! 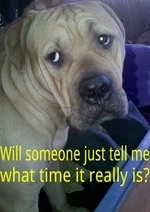 Does your pet have a difficult time adjusting to the time change? Cesar Millan suggests that you slowly ease your pet into the changes in his/her walking, feeding, playtime, and sleeping schedule until the routines are back on schedule. Read more: Can Daylight Savings Time Cause Dog Anxiety | Cesar Millan. Some good advice. The last time change it did affect Artie and Buddy. I’m sorry. I wish they would stop the time changes. Great advice. For sure many will find this useful! Tweeting about this. My dogs had a really difficult time adjusting in the Fall. Hoping if we make small adjustments this time it will help. Interesting. It affects humans so much so I don’t doubt that it affects dogs! hmm never thought of that before…day light savings has never really had an impact on me.